LiveU Matrix: next generation platform for live video over IP. 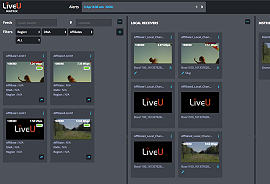 Hackensack, NJ, April 2018: LiveU Matrix is the next generation platform for live video contribution and distribution over IP, enabling broadcasters to view, manage and distribute live content quickly and efficiently. The dynamic cloud platform makes it simple to curate content through one interface. Users can easily search, filter, preview, and distribute live feeds to one station, multiple stations, or thousands of end points within their entire affiliate network. The flexible interface can also be customized based on the user’s role. LiveU Matrix gives full visibility into all feeds available and puts the broadcaster in the driver’s seat to manage and send content anywhere, without interruption or another piece of hardware. LiveU is reinventing live IP video transmission, distribution and online streaming solutions at the NAB Show in Las Vegas, April 9-12 2018. Find us in Central Hall, LiveU Main Booth #C2617; South Hall Upper, The Facebook Live Pavilion; and the Outdoor Exhibition Area, Cobham Tent, #OE14008.